Crafting fresh content to fuel marketing efforts can certainly be challenging. Delivering timely posts to your audience is your aim, but what if you hit the creativity wall when it comes to content marketing ideas? After all, there are 82.7 million new posts published monthly, according to WordPress.com. Those posts generate 43.3 million new comments. You certainly want your share of comments, and the only way to get them is to deliver content that engages. In fact, 99 percent of marketers said that creative content is vital to marketing success. And don’t forget about Google and that page one ranking. Google still places high-ranking value on content still as well. “Content is one of the most important Google ranking factors, according to Andrey Lipattsev, a Search Quality Senior Strategist at Google,” according to Search Engine Journal. In fact, 53 percent of the top 20 search queries have keywords, according to a SearchMetrics study. Only 40 percent of those landing pages have keywords in H1 tags too. This is a clear indicator that content is indeed still king. Here are 20 easy tactics for generating content marketing ideas that will keep your audience engaged with your brand. There are millions of content pieces trying to get in front of viewers. How do you set your content marketing apart? What value are you serving up to your audience? 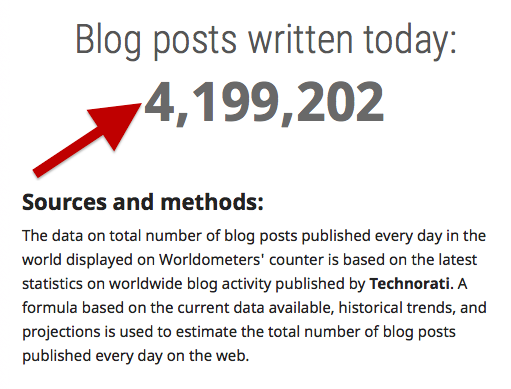 As I write this very post, there has been over 4 million posts already published today alone . . .
To really develop and craft fresh, authoritative material, make your content a product. Ask the question, “Would my audience pay for this information?” If you believe yes, you just found your next post! Newsjacking has long been a popular way to get fresh, timely content in front of viewers. It is important, however, to not simply newsjack for the sake of getting search benefits. You can still use newsjacking to get new content marketing ideas, as long as it’s relevant to your niche. You absolutely should have an opinion on what’s happening in your industry, and your audience certainly wants to hear your opinion! If you were looking for a few trending topics in the Business realm, you can quickly jump on Google Trends and find a few newsworthy topics to give an opinion on. McDelivery and UberEats are certainly timely . 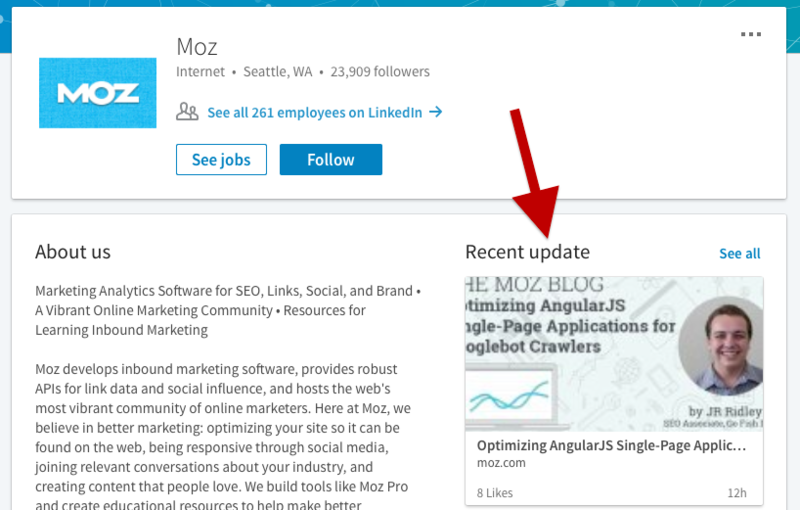 . .
You can even get valuable insight on popular posting times for your future posts as well. Google Trends is certainly worth a look for a variety of reasons. There are times when you need to get more creative with your content marketing, and the traditional blog post or article simply won’t do. The good news is that you can share your posts via slides. Not only will this feed your audience’s need for more visually stimulating content. It will also put a fresh spin on something when a traditional post might not be the right fit. A great slide platform that can get you started is eMaze . . .
Click the “Get Inspired” tab and do just that! You may find a topic you have never considered before. Coming up with new content marketing ideas can be easily overcome if you know where to look. Chances are, your business has had a slew of questions via social media or your contact page. Listen to your audience and leverage those important questions for content marketing ideas. If you don’t have too many questions to draw from, you can visit a few active forums like Reddit and Quara to find questions yet to be answered as well. 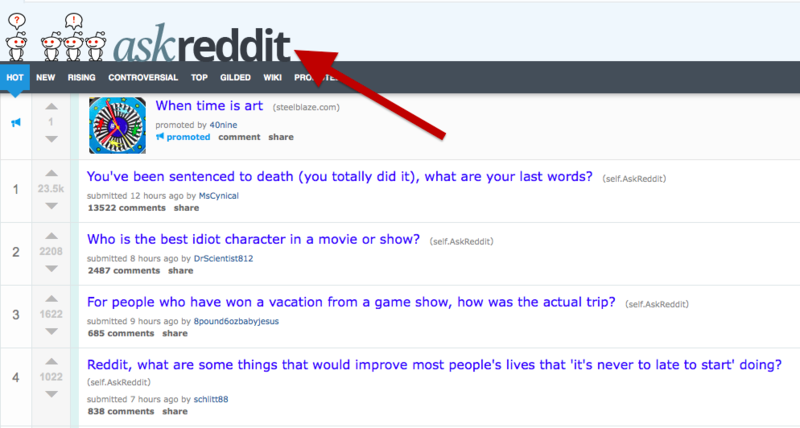 On Reddit you can go to the “Ask Reddit” section and see what people are asking. There are certainly a lot of questions left to be answered online. You can even pose a few questions on your social media to get great trending topics as well. 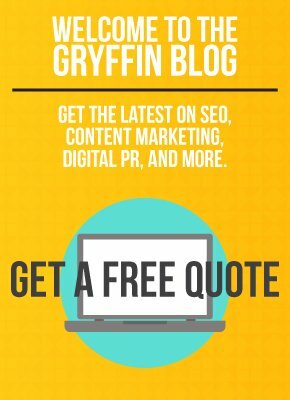 Need some new keyword ideas for your fresh content? Who doesn’t? Keywords are still very much important, especially for Google. And finding new keywords in your niche can prove difficult after a while. Infinite Suggest can help with that! Simply type your main keyword into the search bar . . . Your search will return hundreds of new keywords, including LSI (long-tail) keywords for you to choose from. Maybe you have never crafted a post about an “On Page SEO Checklist” and you could even pair it with an infographic. Finding out what your competitors are posting is another great strategy for gaining insight into your own content marketing ideas. It only makes sense if you want to stay competitive. Subscribe to industry newsletters, and follow your competitors on social media. And don’t forget thought leaders on LinkedIn. 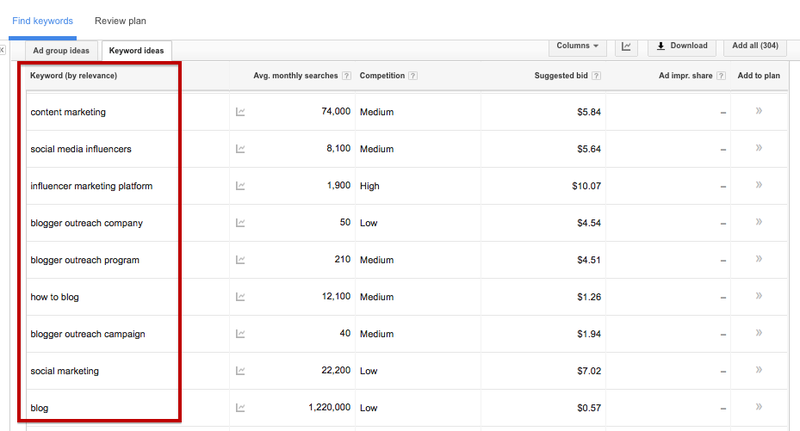 Online tools like SpyFu lets you see what keywords your competitors are using, and their ads. BuzzSumo is another online tool you can use to farm excellent content marketing ideas. You can find out what posts people are sharing the most by researching keywords on this platform. For instance, a quick search of the keyword “SEO” returns a large variety of the most shared content. This helps you gain insight on popular content and boost your chances of engagement for your future posts. This can also help you keep an eye on your competitors too. When you find yourself hitting the content marketing wall, look to the beginning. What were your first few posts about? How can you expand on them? Take those original keywords, revisit them, and expand on them. Building your own mind maps for content can be fun, and you may find a few new ideas from just one of your old blog posts or articles. You can use Google Suggest to expand on your content . . .
For instance, if you wrote about the importance of building influencer relations, you can easily spin that off into a few new content marketing ideas. From influencer outreach to online influencer platforms, there are plenty of ways to expand on that original keyword and topic. Sometimes a little help generating new content marketing ideas is needed. According to Harvard Business Review, having diverse perspectives will increase innovation. This means taking the thought bank outside of the content and marketing departments. Have an employee roundup to uncover new ideas. You may be pleasantly surprised by what you gain from the experience. And team growth could impact your bottom line as well . . .
“Leaders who give diverse voices equal airtime are nearly twice as likely as others to unleash value-driving insights, and employees in a ‘speak up’ culture are 3.5 times as likely to contribute their full innovative potential,” suggests the HBR article. There are a variety of online tools you can use to get fresh content ideas. HubSpot Blog Topic Generator is one of the best. This tool can certainly spark interesting ideas. Simply type a few nouns in the fields and click “Give Me Blog Topics” to get your creative juices flowing. Latent Semantic Indexing (LSI) keywords are becoming increasingly important for SEO and in content marketing. LSI Keywords, also known as long-tail keywords, are essentially related to the keywords you are searching for. They come in pretty handy when you need a new topic idea, especially if you already have a broad keyword in mind. How do you find them? Do a quick Google search of your main keyword . . .
Scroll down to the bottom of the page, and voilà! You get a list of free potential titles. 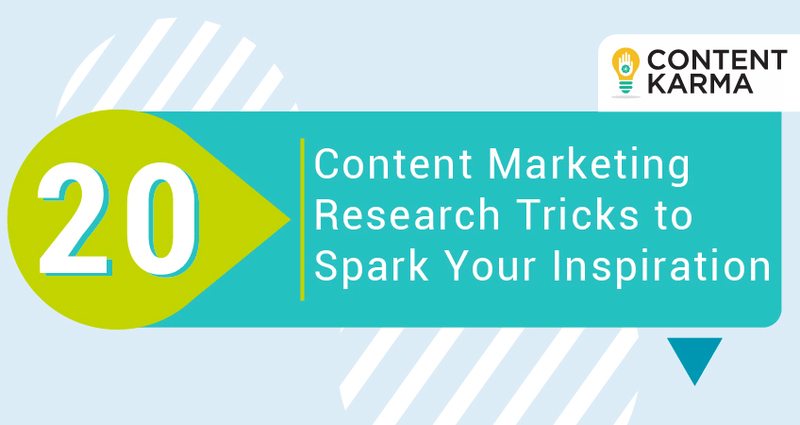 Getting content marketing ideas from Google essentially kills two birds with one stone. You get great new post keywords and titles, and they are from the search engine you want to rank on page one for. Google Keyword Planner can help. 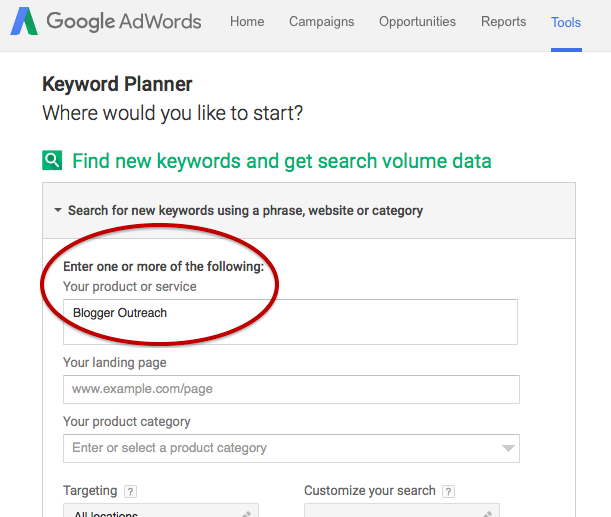 Simply sign into AdWords, go to “Keyword Planner” and enter a keyword you want post ideas for. Your search will return a long list of potential topics. Some are worth exploring, and you can qualify them as worthwhile since Google gives you the average monthly searches for each one. We previously discussed using forums to identify questions your target audience is asking. These are important topics builders, and BloomBerry is a great online platform to make finding those questions even easier. 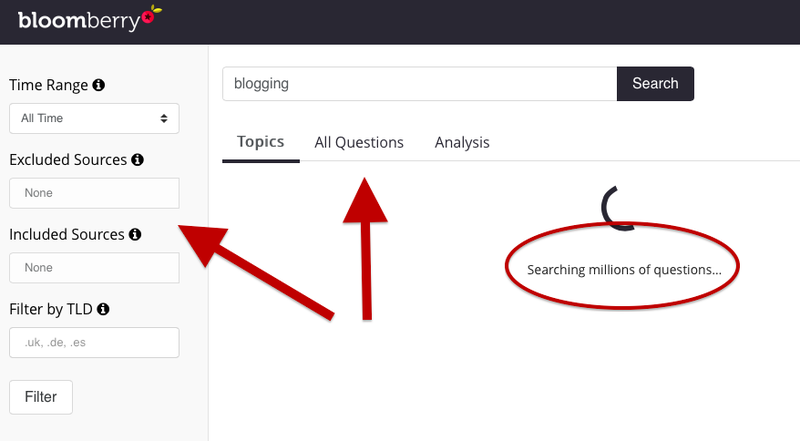 You can use this tool to search million of topics, top questions, and get insight via analysis. You can also filter your search by including or excluding certain sources you may feel irrelevant. DrumUp is another online tool you can use for content marketing research and ideation. It gives you posts from top sources based on your keywords. They cover nearly every industry and niche, making your topic search easier than ever. You can also use this platform to complement your social media efforts as well. When searching for new content marketing ideas, don’t forget to harness the power of social media networks. Pinterest in particular is a fantastic place to find fresh topics to engage with your target audience. Let’s say you wanted to dazzle your fans with a new topic on marketing. You will find a long list of storyboards and Pins to choose from. Do you see a timely infographic you can’t resist sharing on your site. You can even reach out to Pinterest users and ask permission to pair their graphics with your post in exchange for more visibility. Looking for top articles from a site in your niche? GrowthBot can help you find them. This chatbot from HubSpot is a marketing and sales assistant that makes your content marketing search more efficient. This allows you to use top stories your fans are most likely already interested in, and you can see trending patterns for potential topics as well. There is no reason to repeat the old ways of generating content marketing ideas. With Portent, you can type in a keyword and get a nice little working title to begin crafting compelling content around. You can certainly get some odd titles from their content ideas generator. However, if you are looking for topics outside of the box this online tool perfect. You can see the subtle hints Potent gives for the keyword marketing. It is fun, easy, and may spark a new side of creativity your audience has been craving for. If you need to get new and exciting topics daily, your best bet is to set up alerts for the top keywords in your industry and niche. Talkwalker Alerts is a great alternative to Google Alerts, especially if Google is just not sending you the ideas you want. It is set up just like Google Alerts. Simply enter the information in the provided fields and voilà. You’ll be getting fresh content ideas via email in no time. Drawing from social media is always a good idea when generating new content marketing ideas. What better place than Twitter? And what better platform than TweetChat? You enter a hashtag that you may be using for your own social media networks to search relevant Twitter chats. This allows you to pull topic ideas from trending questions and discussions. If you want to find content ideas that are timely and that will put you in position zero of Google’s SERP, check out Google Featured Snippets. What is a Featured Snippet? They are those boxes of information that often answer a query based question. They will appear at the top of page one search results, and you should be thinking about stealing them from your competitors. They come in many forms, from numbered lists to short paragraphs answering a searcher’s question. Think of a few questions your audience may be asking and Google your heart out until you find a Featured Snippet or two for new content. Generating new content marketing ideas may seem difficult at first. 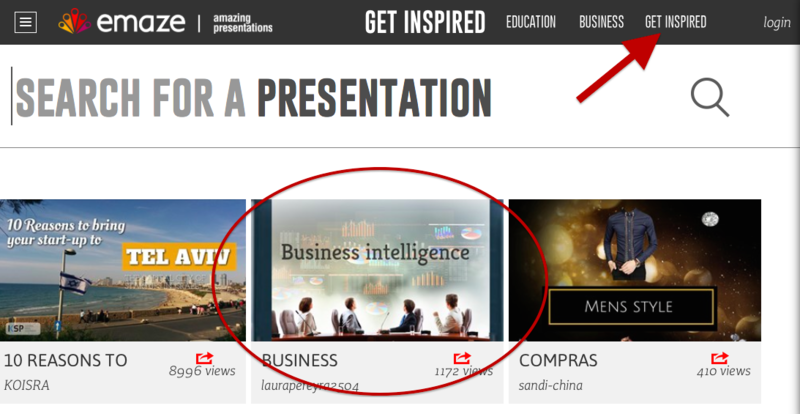 But if you know where to look, you can find exceptional topics your audience can’t resist engaging on and sharing. These are just 20, and the list goes on. How do you find fresh topics to write about?